Our crews have been hard at work connecting this customer’s driveway to the rear deck steps, and then on down to the lake boathouse boardwalk – a total of 145′ of paver work. Additionally, they upgraded a wooden border planting bed with a 40′ stone retaining wall, and installed some plant material and night lights along the lake walkway. As usual, click on any photo to get a closer look. Stone work can really kick up a cloud of dust …. … but the results are worth it. This retaining wall is an elegant addition that defines the planting bed with stone that matches the coloration of the walkway. Notice how our crews used a stepped stone configuration to form a seamless segue of the wall as it turns up the slope. 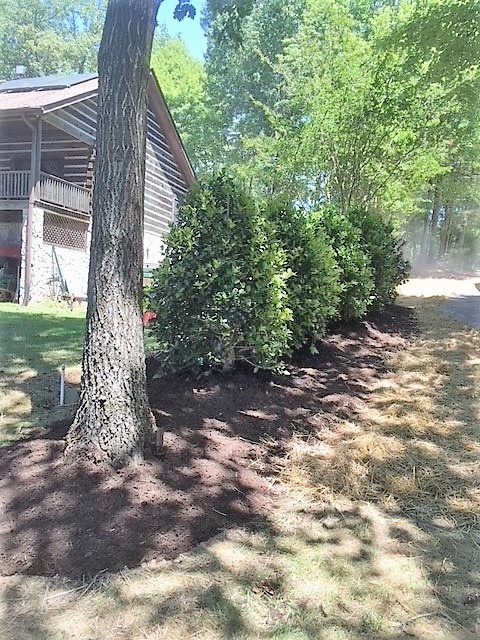 We also removed some existing plant material and installed these Emily Bruner hollies in some fresh mulch along the property line. As always, our guys then cleaned up the work areas with fresh mulch, fescue seed, and straw.